Sheila's "Sacketts in Australia" paper includes previously unpublished research in Australia of a number of Sacketts who immigrated there and information on their descendants, a number of whom were not previously known to us. Reunion 2010 convener Kathryn James has launched a new website especially for this year's reunion in Portland, Oregon, and Vancouver, Washington. 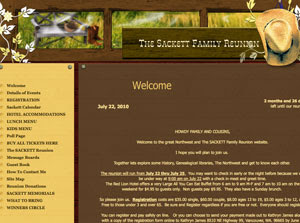 Kathy promises surprises, prizes and special activities at this year's reunion, as well as the opportunity to meet with your Sackett kinsfolk. Sackett Family Association members were greatly saddened to hear of the death, on 31 March, of their president Tom Smith. Tom was a founder member of The Sackett Family Association and made a considerable contribution both to the research of the Sackett family history and to the successful formation and development of the Association. He served as a committee member of the Association for many years, eventually taking on the presidency in May 2009. He was taken ill with cancer just a few months into his term of office. Tom was instrumental in setting up the DNA testing project in 2004 and continued to administer the scheme. 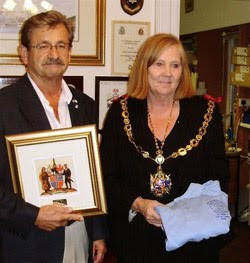 He supported enthusiastically the Sackett family reunions, most recently at the Thanet, Kent, gathering in September 2008, when his courteous manner and gentle dry sense of humor won the hearts of friends old and new. Tom will be remembered with great affection by all those Association members who had the privilege and pleasure of meeting him.